It was such a relief to discover John Cleese's Autobiography, So, Anyway... was so easy to read with its conversational style. Not to say that other former Python, Michael Palin, with his Python Diaries is a bad read but when you open his book a kitchen sink pops out, such is the attention to detail (and the nature of a well written diary). John even makes a quip about Michael's obsession with recording every aspect of his life. John's book takes us through his early life including background on his parents, school days, college, and early TV, radio and theater career. Along the way he highlights the origins of some of his most well known comedy sketches and other events that inspired ideas for scenes in films, sketches and more. Sometimes he gets sidetracked into giving his thoughts on why a particular character or comedy premise works (such as why Basil Fawlty works as a comedic character) and it's these moments that I really enjoyed reading the most. I also found it fascinating that before Python, John seemed to have worked with nearly every legendary (or soon to be legendary) comedy writer out of the U.K. of his generation. For example he's worked with every member of the Goodies at various times, as well as the Two Ronnies, before Python even was a thought in anyone's mind. The only downside of reading this book is that, as you begin to realize you're getting closer and closer to the end, you also realize that John's probably not going into his years with Python and then his work after that in any great detail. 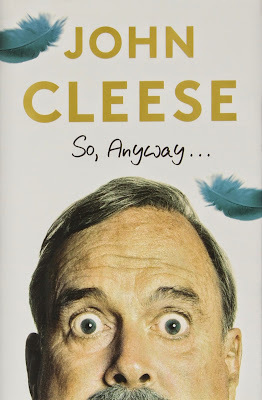 Sure he touches on a few stories of his later career, writing with Graham Chapman and even added a chapter for the Python reunion shows at the O2 in 2014 but I can't believe there isn't more to be told. I'm hoping at some point John will write another book relating stories from Python to present day which could be called 'So Where Was I...'. One can only hope. Otherwise this is a very enjoyable and easy read. A must for fans of John's work looking for a bit of insight into an impressive career. Glad you liked the book. I haven't got to read it yet. I was going to look for it at the library, with my book space at home forever dwindling. I did look at the first few pages, and it did seem interesting and easy to read . 'Course, I remember seeing him on the black and white TV in the UK back in the 60s in comedy sketches and I think on David Frost's shows. He was always the tall, thin character in the suit and bowler hat. If you remember him from David Frost's shows then this book may be a bit more of a trip down memory lane for you than it was for me. John covers his earlier career in much more detail than he does anything from Python onward. He actually owes much of his early career success to David Frost (as do many other comedy writers from that period).